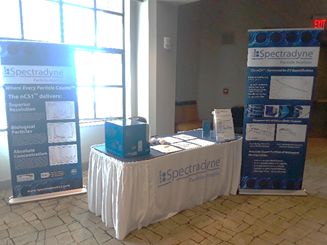 Spectradyne recently exhibited at the Circulating Biomarkers World Congress in San Diego, a conference focused on using measurements of extracellular vesicles (EVs) for diagnosis of various health issues. This was a small but great, focused, show that confirmed how hot the EV area is! Research into EVs (or exosomes, or nanovesicles) as biomarkers is rapidly expanding, and has become an important area of the more general discipline of liquid biopsy. Health areas being investigated with exosomes biomarkers include cancer, cardiovascular disease, reproductive issues, and neurodegenerative disease, among others. Of course, any exosome-based diagnostic technique must be able to differentiate healthy from unhealthy patients by quantifying the presence of the exosome biomarker or biomarkers in question. This could be as "simple" as quantifying the concentration of one population of exosomes, or more complex, for example in comparing the concentrations of multiple types of nanovesicles (or perhaps vesicles compared to non-vesicles), to establish a "fingerprint" of a disease. In our conversations at the conference, it was clear that that while most researchers have an approach to determine whether a target EV (or related DNA or microRNA) is present in a liquid biopsy, there is much less expertise in accurate quantification of biomarker concentration. Spectradyne's technology is well suited to this kind of exosome measurement challenge (see some examples here). Our microfluidic resistive pulse sensing (MRPS) technology counts vesicles (or other particles) individually and therefore builds up highly accurate statistics on nanoparticle concentration across any size range from 50 nm to 10 microns. For our technology, high levels of polydispersity are handled easily. This allows the researcher to clearly establish the level of background nanoparticles relative to the exosome population in any biological fluid (we measure serum, plasma, urine, and cell culture media routinely), which is important because the relative measure of exosome "signal" compared to background can be critical to the quality of the diagnostic conclusion. Finally, importantly, MRPS is a non-optical technology and therefore provides a key check on the findings of other metrology methods, most of which are based on light scattering. Biases related to the optical properties of the exosomes or nanovesicles are inconsequential to our MRPS method, and this can lead to important insights that are otherwise missed if only optical analyses are done (see this article for an example). The Circulating Biomarkers conference was exciting in terms of the high quality of science on display as well as the energy of the researchers. We look forward to seeing more of this at our next big conference, ISEV, in Kyoto in just a couple weeks! Please continue to follow our blog as we share insights, technical details, and generally geek-out with you about nanoparticle science! Email us for more information, or to discuss your particular application directly. Spectradyne's nanoparticle analysis systems are based upon a long-time, proven technology, resistive pulse sensing (RPS). RPS uses electrical signal detection as its basis, which yields numerous advantages over the optically-based detection used in the majority of particle analyzers. In the late 1940's, Wallace Coulter was studying ways to do rapid screening for diseases by blood cell analysis. Prior to this, analysis of blood cells required laborious examination under a microscope. Coulter was interested in automating this process to make it widely available as a tool for rapid screening of large populations, and eventually received a grant from the Office of Naval Research which partially funded the research. Initially, he and his brother Joseph were looking at an approach using a light beam focused through a narrow capillary tube to detect and count the cells but found that the electrical contrast created by the cells produced a 10X higher signal than photoelectric signals [M. Don, "The Coulter Principle: Foundation of an Industry," JALA: Journal of the Association for Laboratory Automation 8(6), 72-81 (2003)]. In 1953 Coulter was awarded US Patent 2,656,508, "Means for counting particles suspended in a fluid". The method is widely known as the Coulter principle, in which a particle passing through a small pore will produce a change in the electrical resistance of the pore, proportional to the volume of the particle passing through. The Coulter principle is more generically referred to as resistive pulse sensing (RPS), as shown in the figure to the right). Unlike optically-based measurements, the signal measured is independent of the particle's material properties (including optical contrast) and shape. This is a key advantage of RPS. Since the early 1960's, Coulter counters have been the gold standard for doing whole cell blood counts. Therefore, instruments based on RPS are using technology that has a proven track record, with literally millions of samples being run every week. However, up until recently, RPS devices were generally limited to 1 micron and larger diameter particles. Attempts to scale Coulter principle instruments to smaller sizes have found limitations caused largely by thermal noise in very small apertures. While there have been some published reports dating back to 1970 on RPS devices for sub-micron particles [R.W. DeBlois and P.C. Bean, "Counting and sizing of submicron particles by the resistive pulse technique", Rev. Sci. Inst. 41(7), 909-916 (1970)], these have been largely limited to academic, "one-off" devices that were not commercialized. However, technological advances in seemingly unrelated disciplines have created methods that overcome these size limitations. In particular, advances in semiconductor fabrication techniques have been applied to the burgeoning field of microfluidics, which have enabled commercialization of RPS instruments that can size and measure particle concentrations to particle diameters as small as 35 nm. Spectradyne's RPS implementation is designated microfluidic resistive pulse sensing (MRPS), implementing the fundamental RPS implementation in a microfluidic cartridge that only requires 3 μL of sample for measurement. A description of this implementation was first published in 2011, and became the basis for the incorporation of Spectradyne in 2012, and the commercial introduction of the nCS1TM instrument in 2014. 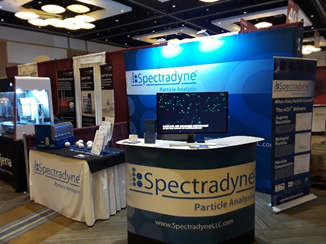 A few weeks ago, Spectradyne exhibited at PepTalk 2019 in San Diego CA. The conference was notable for the high quality of the presentations and the deep scientific knowledge of the researchers - as a result, we had many informative conversations at Spectradyne's booth (which we think looked quite sharp, see image!). A common theme throughout these conversations was the need for better, more efficient detection of protein aggregation. A few years ago, when we brought up Spectradyne's ability to measure submicron protein aggregates, we were often asked, "Why would we want to do that?". The discussion in these cases centered around the fact that the FDA and USP had no clear requirements on nanoscale particle measurements. At PepTalk, there were multiple occasions where scientists told us that the ability to detect smaller aggregates would save them time. In these cases we didn't really even have to explain the benefits of detecting aggregates earlier with our nCS1 instrument! These scientists already understood that all micron-sized particles were once submicron particles, so why waste time waiting for big particles to form, if you can detect them earlier when they're smaller? Increasingly, biopharma companies know that it is a competitive advantage to be more efficient in sorting winning from losing formulations. This means earlier detection of protein aggregation is good for business, regardless of a lack of hard regulations on nanoscale aggregates. The fact that Spectradyne's nCS1 instrument only requires 3 microliters of sample to make a measurement makes this process even more efficient. So, PepTalk was great for Spectradyne in that we saw broader acceptance of the benefits of detecting protein aggregates at the submicron scale. However, for an instrumentation company like us, that's only halfway to our goal. The other half is demonstrating that our technology is the best way to achieve those beneficial nanoscale measurements. There are, of course, other methods of detecting nano-aggregates. Most of these utilize light scattering and suffer severe sensitivity limitations in detecting submicron biological particles, which tend to be relatively transparent. More insidious, the variable detection limits of these techniques are not always obvious to a non-expert, so incorrect conclusions about particle concentration levels can easily be reached. This is a big topic, though, so we'll reserve it for another blog post. This first post will introduce you to the key applications of Spectradyne's nCS1TM, a cutting-edge technology for measuring the concentration and size of particles in a liquid using Microfluidic Resistive Pulse Sensing (MRPS). As an electrical (non-optical) technique that counts and sizes particles one-by-one, MRPS accurately measures the concentration of any particle material, even in the most polydisperse mixtures-that is, in real-world samples. Best of all, sample analysis requires only 3 microliters. Aggregated protein samples are highly polydisperse and confound light-scattering based technologies such as Nanoparticle Tracking Analysis (NTA) and Dynamic Light Scattering (DLS). Note that DLS only measures a weighted average size, not a particle size distribution. Because Spectradyne's nCS1TM quantifies smaller particles more accurately, researchers are using it to quantify aggregates dramatically earlier in the process of their formation, without having to wait for the particles to grow large enough to be detected by other methods. As extracellular vesicle (EV) research has matured, conventional technologies for their quantification such as NTA and TRPS have not kept pace to meet the increasing standards of rigor. Spectradyne's nCS1 is a fast and practical method that accurately measures the concentration and size of EVs. The microfluidic implementation of RPS avoids the operational difficulties and variability inherent in other, more simplistic embodiments of the technique, making the nCS1 robust and easy to use. As a result, Spectradyne's technology is quickly being adopted by EV researchers around the world. Accurate quantification of gene therapy vectors and nanomedicines is critical for evaluating the bioactivity of these therapeutics. However, nanoparticle-based therapeutics often scatter light weakly, making accurate quantification by conventional light-based particle sizing techniques impossible. Assessing the concentration of viral vectors by biological titer takes significant time and resources. Spectradyne's nCS1 measures low-index-contrast particles such as these accurately, quickly and easily-obtain the viral titer or quantify dosing of your favorite nanomedicine in just a few minutes. Nanoparticles serve as functional ingredients in a wide variety of products, and their size distribution is a critical parameter that governs their performance. 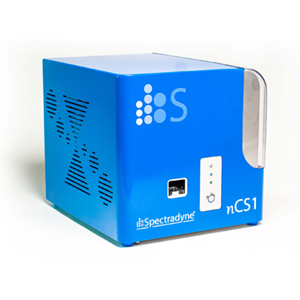 Spectradyne's nCS1 measures particles one-by-one and delivers quantitative, high-resolution size distributions that cannot be obtained with other technologies.